You can either invite particular persons to your tree or send someone the url of any ancestor page. If you invite someone, he or she can see data on living people in your tree. If you send someone a url, they can only see data on the dead people in your tree. Data on living persons is never visible to the public even in public trees. Warning: Invitees can see everything in your tree that you can. That means they can see data on living people. Click on "Invitations" in the left side menu. 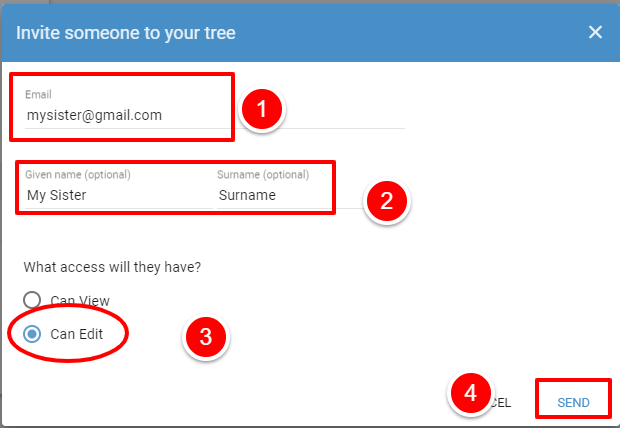 Click the "+" next to "Invite family members to view or edit your tree"
Enter the persons email address, their name and then click either "can edit" or "can view". "Can Edit" means this person can help you grow your tree. He or she can add and delete data in your tree. Click "send". An invitation will be sent to their email address. You can go back and alter this at anytime.